Authors: Rasinkin S.M. Petrova V.V., Konovalov D.P., Bragin M.A. Organization: State Scientific Research Center n.a. A.I. Burnasyan — Federal Medical Biophysical Center of Federal Medical Biological Agency, Ltd. "MontClinic"
The purpose of this study is to explore special cooling liquid in sports. We can predict the decrease in body temperature, reducing dehydration and increasing endurance using this liquid. Finally, special cooling liquid improves physical activity at high temperatures. 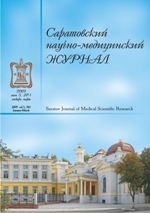 Authors: Popov M.V., Voskanyan S.E., Aronov M.S., Karpova O.V. Objective: assessment of safety and efficiency of application of the method of the distal and proximal embolization of the right branch of a portal vein using an occluder for preventive increase of the small future remaining liver amount in case of the planned resection. Material and methods. In the Burnazyan Federal Medical Biophysical Center that method was used in two cases: metastasises of bladder cancer in one case and of colorectal cancer in second case. Patients were males aged 57 and 64. Measuring the amount of future remaining liver volume was carried out with the CT-volumetry. Portal vein embolization of the right branch was carried out by transhepatic ipsilateral access using polyvinyl alcohol particles and occluder AVP II. Results. As a result in both cases the gain (9 and 24%), sufficient for performance of a resection, of the remaining liver volume was noted; the progression of the tumor process and periop-erative complications were not observed. Conclusion. Distal and proximal preoperative portal vein embolization is an effective and promising method, allowing surgeons to increase the number of operable patients and reduce the risk of postoperative liver failure. Authors: Bril Е.М., Udalov U.D., Anikina M.A., Zimnyakova O.S. Pain in Parkinson disease take the special place among all of disease symptoms due to it pathogenetics and clinical diversity. In spite of the plurality of resent studies, the majority of clinical practioners and neurologists didn't pay attention to significant decline of the quality of life in patients with Parkinson disease and pain disorders. This article was created with aim to summarize all important results of studies, focused on pain pathogenesis and clinical features on different stages of disease. All articles of the authors: Zimnyakova O.S. , Udalov U.D. , Bril E.V. , Anikina M.A. Authors: Miroshnik E.V., Yeliseyeva N.A. The cohort pilot study had been done. Aim: to study the effectiveness of an antistress activation therapy on the functional state of human with the purpose of formation of adaptive reactions of activation and training high levels of reactivity among the two groups of patients with cardiovascular problems, ranks first among causes of death population: arterial hypertension (AH) and coronary heart disease (CHD). Material and methods. From the sub-sample of the Moscow population (396) were allocated to 2 groups of patients of 30 people in each (a control group and a group for anti-stress therapy for persons with hypertension and coronary artery disease that within 1 month took adaptogens (tincture of ginseng, Eleutherococcus, etc.) is minimized by a specially developed algorithm. For stress diagnosis international integrated questionnaire Perceived Stress (PSS); as well as Hospital Anxiety and Depression Scale (HADS) were used. Blood pressure, heart rate, body mass index, waist circumference were measured. In addition we used new methods "Antistress activation health improvement". Results. The average age in the intervention group was 59.4 years, and in the control group was 58.3 years, p>0.05. In compliance with results of the study has been marked that persons who were treated by methods "Antistress activation health improvement" sensed general and "internal" dumping, improving of duration and quality of sleeping. Irritability, level of stress, depression, and fatigability became rather less. Dynamics of emotions locked in psychometric scales showed distinct improvement of mood, decrease of fear, sorrow, anxiety, anger, emotional instability, increase of self-reliance, activity. Conclusion. The treatment of stress, anxiety, and depression must be complexes based on biological and psychological approaches. All articles of the authors: Miroshnik E.V. , Yeliseyeva N.A. Authors: Tukov A.R., Shafransky I.L., Kapitonova N.V., Prokhorova O.N., Samoilov A.S.
Purpose: estimation of the risk of cataract using doses of different types of radiation. Material and methods. The study is carried out using the information database of the NP, recovery workers of the accident at the Chernobyl NP. Professional exposure and dose received during 30 km zone were used to calculate the risk. Results. The study shows the use of one of their parts of the total radiation dose of man, leads to obtaining of different levels of the risk of disease. Conclusion. Only use of a total radiation dose can lead to obtaining of the correct results of evaluating the risk of the emergence of the radiation- induced diseases. All articles of the authors: Tukov A.R. , Shafransky I.L. , Samoilov A.S. , Prokhorova O.N., Kapitonova N.V. The purpose of this work was to submit the review of data of the scientific literature devoted to a FISH method as a way of cytogenetic retrospective dose evaluation. Problems of cytogenetic retrospective assessment of a dose in general; molecular and biological bases of a FISH-method; types of chromosome aberrations identified by means of a FISH-method; the principles of creation of dose curves for the FISH-registered chromosome translocations have been considered. The conclusion is drawn on need of attraction of three-color and multi-color variants of this technique to retrospective dose evaluation. All articles of the authors: Nugis V.Yu.